Winter training is almost over, but there are still a couple of weeks to go. There’s no doubt that many of you will have had a game postponed over the past couple of months due to poor weather conditions, and it’s also likely that your players will have rolled out of bed for training, seen the horrible conditions and crawled straight back in! During the winter months, it is very important to change up parts of your usual training routine to make sure you are getting the most out of your sessions, all the while keeping your players in the best condition possible, especially in youth football. To help you, we’ve put together a simple training session to keep your players active and warm in the lead up to spring. Begin by marking out a large oval shape with cones spaced about 1m apart. Ask the players, using a ball, to dribble in and out of each of the cones following the oval circuit. Then ask them to repeat this activity, speeding up after every loop they complete whilst you set up the next activity. This will help to get the blood pumping and get your players warmed up for the following activities. To progress this warm up further, add more cones or change the layout by adding more complex turns and tighter gaps. Additionally, ask the players to use their weaker foot only or you could try turning it into a race by making the players sprint back to the starting cone once they have completed the circuit. It’s important to keep players moving when the weather is cold and so you need to incorporate this into your training routines. A great routine for this is a speed and agility activity which is used for a high-intensity workout. Start by laying out two cones roughly 10m apart, then use a third to create a triangle. Directly behind the third cone add 3 more, each needs to be 1.5m from the other to make the triangle bigger (see diagram below). Set out a 20m x 20m square with cones, and inside that another 2m x 2m square. Now separate your players into 2 teams, leaving 1 individual to act as a neutral player. Place one player from each team on either side of the outer square and place the neutral player on the inside of the centre square. Place the remaining players from each team inside the outer square. 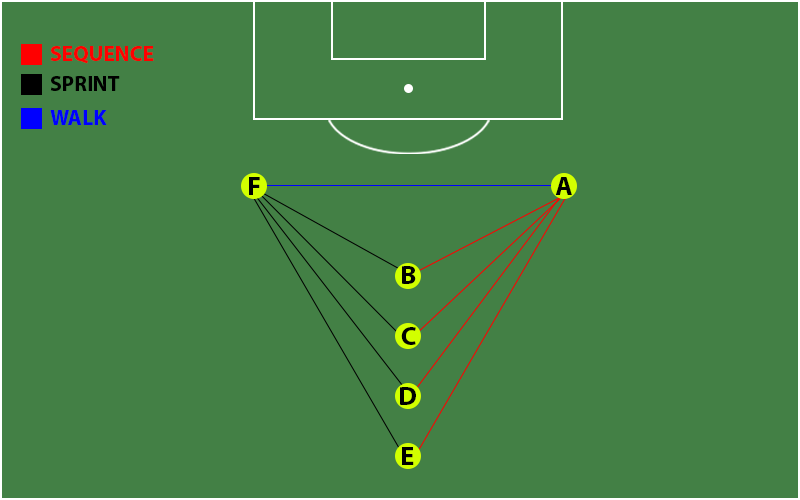 These players must compete against the opposing team to win the ball within this space, to then pass the ball to the neutral player inside who must return it to the same team. Finally, the ball must be passed to their team member on the outside of the larger square. Repeat this activity, giving 1 point each time to the winning team. Everyone loves to put their training into practice and what better way to do that than with a proper game of football! Start the game off as normal, with players following the standard rules they know best. After about 10 minutes change the rules so that players can only have 3 touches of the ball. This is aimed to improve first touch, spatial awareness, and is also a great technique used to stimulate passing and moving to support the player on the ball. In addition, you can focus on other aspects of the game that you may wish to improve on. For example, to practice crossing the ball into the box, simply impose a rule stating that goals can only be scored from crosses, i.e. the ball must be crossed into the box to score. Another area you may wish to focus on is ball retention or possession. To do this, call a five minute time period where teams cannot score but must retain possession of the ball. The team with the ball at theend of the 5 minutes is awarded a goal. After playing high-intensity games it is important to do a cool-down to help avoid injury. The cool-down will return the body to a resting state, gradually reducing the heart rate and breathing. A very easy and effective way of getting your players to do this is a low-intensity jog or walk for 5-10 minutes. This will help to reduce the body temperature and remove any lactic acid from your body which may have built up during this high-intensity training session. Excellent, you got some more of these? Sorry for the late reply, we have been going through some changes with our blog, but rest assured that we will post something like this pretty soon. We will get some video content ready for you!